Laptops may start heating up if you do not regularly blow out the fan that keeps the CPU cool. I cleaned out a friends and there was so much dust the channel between the out take and intake area was totally plugged with dust. It was heating up and shutting down and generally acting wierd, once the dust was removed it worked like new. How do you clean out the fan on your Laptop? First you need to buy a can of compressed air for Computers at your local Computer shop or most big box stores that sell computers. They come with a small straw that you attach to the sprayer head, that way you can get into the grills farther and it has more force. 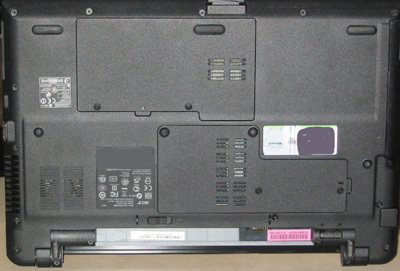 Every Laptop has a different layout and the type of fan system they use. Mainly you want to find where the air is coming out of the Laptop, that will be the out take grill, not far from that will be the intake grill, that is where you will feel air being pulled into the fan. You need to have the Laptop running to locate these. Just use your hand to feel for the air flow. As I mentioned above that dust builds up on and in the fan area this can make your Laptop heatup causing problems with the Laptop it can over heat the CPU and permanently damage the Laptop. So a little prevention can make your Laptop last a lot longer. A can of compressed air cost around $5-8 dollars, you can also use it to blow off the Keyboard at the same time you clean the fan. Once you are done let the Laptop set and dry for 5-10 minutes before you put the Battery back in and plugin the Power cable back in, then turn it back on. Note: If you are uncomfortable doing this take it to a Computer repair Tech. Like I said in the beginning of the article one of the Laptops I cleaned out, the dust had literaly plugged up the channel between the Fan and out take grill, on that Laptop I had to take it apart in order to clean out all the dust. I had to use a twizzer to pull the dust out of the channel. 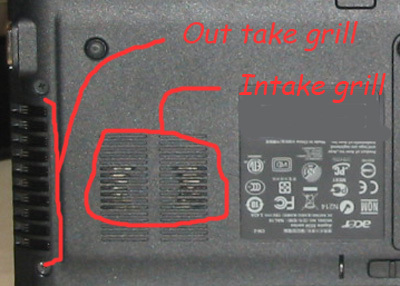 If your Laptop is very hot and is shutting down or no air is coming out of the out take grill, it maybe plugged with dust. If doing this does not clean it out you may need to have a Tech clean it for you.